Oswald Avery led the team that discovered DNA passes heredity instructions through successive generations of organisms – it carries the chemical code of life. Avery and his colleagues published their discovery in a classic paper describing what came to be known as the Avery–MacLeod–McCarty experiment. The experiment actually represented more than a decade’s worth of scientific investigations. Oswald Theodore Avery was born in Halifax, Nova Scotia, Canada on October 21, 1877. His British parents, Joseph Francis Avery and Elizabeth Crowdy, had arrived in Canada four years earlier. They had emigrated because Joseph, a Baptist minister, felt a spiritual calling to do God’s work in North America. The couple’s three sons were all born in Canada; Oswald was the second son. The family moved to New York City, USA when Oswald was 10 years old. His father had been invited to take over as pastor of Mariner’s Temple Baptist mission. The mission was on New York’s lower East Side, an overcrowded part of the city with a multitude of social problems – a tough place for children to grow up. In their spare time Oswald and his older brother Ernest taught themselves to play the cornet. From the age of 12 onwards Oswald and Ernest performed music on Sundays outside the mission. The idea was to entice passers-by inside. The neighborhood’s population included many Catholics and Jews, and Oswald’s father was eager to convert them to the Baptist creed. Oswald was a highly talented musician. Later he was awarded a scholarship to the National Conservatory of Music, a scholarship he did not use. At the age of 15, Oswald suffered two shocks: first the death of his brother Ernest most likely from tuberculosis; then the death of his father from kidney disease. In 1893, just before reaching the age of 16, Oswald Avery got his diploma from New York Male Grammar School and enrolled at Colgate Academy. He became a freshman at New York’s Colgate University in 1896, where again his musical talent shone through and he became leader of the college band. He majored in humanities, averaging higher than 9 out of 10 in his final years. He graduated with a bachelor’s degree in humanities in June 1900, age 22. He had taken science courses only when they were compulsory. The courses he chose in his final year included Philosophy, English Literature, Political Economy, Public Speaking, and History of Art. By the fall of 1900, Avery’s ideas about his future had changed dramatically: he entered medical school – Columbia University’s College of Physicians and Surgeons in New York. He continued to score good grades at Columbia, with one ironic exception. The man who would eventually become a world-renowned bacteriologist scored his worst grades in the bacteriology course. In 1904, age 26, Avery graduated and moved into general medical practice. After two years working as a family doctor, Avery was fed up. Too many of his patients were suffering from incurable conditions, leaving him feeling thoroughly helpless. He reached the conclusion that the best way he could help society would be to find ways of stopping microorganisms killing people. He decided to become a microbiologist. He made the transition gradually, working part-time in milk bacteriology – his job was to make measurements of bacteria in milk before and after pasteurization. In 1907, age 30, Avery became assistant director of the Hoagland Laboratory in Brooklyn, New York. There, in addition to teaching students, he trained in modern chemical and bacteriological methods. He also learned to carry out experiments with unusually meticulous care – this would be one of the characteristics of his future research work. He began his research career with a study of fermented milk products such as yogurt. He investigated their role in controlling harmful gut bacteria in humans, a theme that would became fashionable again about 100 years later. Image of Lactobacillus plantarum bacteria, common in fermented foods. The presence of such bacteria in the human gut is believed to improve our health. Avery published nine papers in academic journals. In 1913, a paper he wrote about tuberculosis caught the eye of Rufus Cole, director of the Rockefeller Institute in Manhattan. On a visit to Hoagland, Cole made a point of having a chat with Avery, sizing him up. The upshot was that Avery became a bacteriologist at the Rockefeller Institute in September 1913, a month before his thirty-sixth birthday. For the rest of his career, Avery focused his research on pneumonia bacteria. Penicillin antibiotics were still decades away, and over 50 thousand people in America were dying of pneumonia every year. America entered World War 1 in 1917. Avery attempted to join the U.S. Army Medical Corps as an officer. He was refused, because, although he had lived all his adult life in America – over 30 years in fact – he was not a citizen. Avery, 40 years old and an eminent bacteriologist, enlisted as a private – the lowest rank. Then, because he was on active duty in wartime, he was naturalized as an American citizen. In 1918 he was promoted to Medical Corps Captain. In 1866, Gregor Mendel, working in Moravia (now the Czech Republic), showed offspring inherit their parents’ physical characteristics according to clear mathematical rules. His work was ignored until 1900. In 1871, Friedrich Miescher in Germany discovered a new substance, naming it nuclein, because it came from the cell nucleus. Today we call this substance deoxyribonucleic acid or, more simply, DNA. Scientists did not actually suspect that DNA played a role in heredity. They knew something must carry instructions from parents to offspring, and they knew the instructions followed Mendel’s laws. These instructions – the units of heredity – were given the name genes. Nobody knew what genes were made of, but for a long time they were thought to be based on proteins. In 1928, Frederick Griffith in the UK found something amazing – he turned one strain of bacteria into another. His work involved Streptococcus pneumoniae, a species that has two strains – Rough (R) and Smooth (S) – so named because of their appearance under the microscope. Cartoon representation of Streptococcus pneumoniae rough and smooth strains. Rough is not especially harmful. Smooth is a killer. Mice infected with R survived – as expected. Mice infected with S died – as expected. Mice infected with heat-killed S survived – as expected. Mice infected with a mixture of R and heat-killed S died – NOT expected. Moreover, living S were found in the bodies of mice infected with a mixture of R and heat-killed S – NOT expected. Something from the dead S had prompted the living R to produce living S. And, very significantly, the change was heritable: When R was transformed to S, the following generations of bacteria were S.
Griffith’s work interested Avery. It related to his own specialty – pneumonia bacteria. Avery admired Griffith, but greeted his extraordinary results with disbelief, suspecting the bacteria were contaminated. A young research fellow in Avery’s lab, Martin Dawson, repeated Griffith’s work. When Dawson confirmed Griffith’s results, Avery was forced to admit that R to S transformation was a fact. Other laboratories came to the same conclusion. Dawson continued researching the strange phenomenon. In 1930, he made significant progress, proving that mice were innocent bystanders. He mixed R and heat-killed S bacteria in glassware and saw R reproducing to produce S.
Dawson moved to a new job and Avery enthused another young Rockefeller researcher, James Alloway, to begin working on what he called the transforming principle. Alloway dissolved heat-killed S cells and filtered out fragments to leave a fibrous substance. We now know this was DNA, but Alloway did not. He found this substance was all that was required to transform R to S. In 1932, Alloway moved to a new job. The white substance is DNA extracted from cell nuclei. Dawson and Alloway offered theories about the transforming principle, neither of which would prove to be correct. Avery began carrying out experiments himself, but his time was severely limited by work on other major studies. He also spent about six months away from the lab seriously ill. The experiments were difficult, often producing results that could not be repeated. Progress was very slow. By 1935, Avery’s evidence suggested to him that neither proteins nor carbohydrates caused the transformation. Perhaps, he speculated in 1936, a nucleic acid was the key factor? Of course, there are only two nuclei acids, DNA and RNA, so Avery was getting close to the answer. However, many more years would pass before he felt he had proof of his speculation. In 1935, Avery was joined by a new young researcher, Colin MacLeod, a prodigy who had been admitted to Montreal’s McGill University at the age of 15. MacLeod and Avery had unusually similar backgrounds: they were each natives of Nova Scotia and each had moved to New York. They were both qualified medical doctors who had shifted careers into bacteriology. Their fathers had both been protestant church ministers, and both had moved to Canada from the UK. MacLeod gave the research a new impetus, developing more reliable laboratory techniques. However, both Avery and MacLeod were involved in other projects too. In 1940, they dropped all other work to concentrate on the transforming principle, toiling together for long hours in the laboratory. By 1941, Avery and MacLeod were certain the transforming principle was protein-free and lipid-free. They knew this because they could reliably remove these substances from heat-killed S bacteria, and see that whatever was left caused the R to S transition. At this stage MacLeod officially left the project; he had been appointed Professor of Bacteriology at New York University’s School of Medicine. In practice, however, he came back frequently as the project neared its exciting conclusion. With MacLeod’s official departure, Maclyn McCarty, a 30-year-old postdoctoral fellow from Indiana, joined the project in September 1941. McCarty had been carrying out research at Johns Hopkins Hospital. When his boss there, Professor Edwards Park, heard McCarty was going to join Avery’s lab, he told McCarty that Avery was at the top of the stratosphere for research. Progress was now rapid. The scientists removed all other parts of the cell to leave just the transforming substance. McCarty established by chemical testing that the substance could only be deoxyribonucleic acid, i.e. DNA. Avery noted that DNA had not even been found in these bacteria before. Near the end of 1943, Avery, MacLeod, and McCarty submitted their work for publication in the Journal of Experimental Medicine. It was published the following year. They had discovered that DNA is genetic material. It induces heritable changes in bacteria. It has very high molecular weight, and is therefore a huge molecule. Their work came to be known as the Avery–MacLeod–McCarty experiment. Ironically, Avery’s work was completed while World War 2 was raging. He and his colleagues discovered one of the secrets of life in a time when more scientists than ever were seeking efficient ways of delivering death. Avery was 66 years old when his DNA work was finally published. The idea that genes are DNA was strongly resisted. A number of influential scientists would not let go of the idea that genes were proteins. They explained away Avery’s results by saying his DNA was contaminated by proteins. However, in time, nobody could contradict DNA’s new status. One of the few scientists to quickly embrace Avery’s work was Edwin Chargaff, and it was he who took the next great steps toward understanding DNA’s role in genetics. By 1953, James Watson and Francis Crick had discovered DNA’s structure and how it replicates. Avery lived long enough to see this. Scientists now know with certainty that DNA carries the instructions needed to assemble lifeless molecules into living organisms. Avery was never awarded a Nobel Prize. 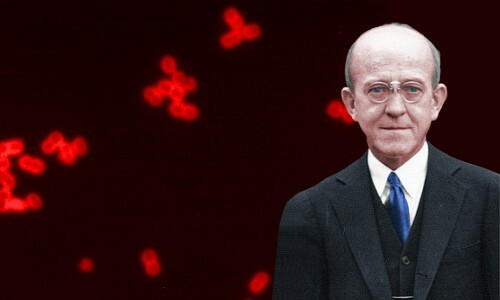 He was nominated frequently for work on antigens he did in the 1930s. He was also nominated for his DNA work. The nominations were not successful. In 1945, the British Royal Society awarded Avery its prestigious Copley Medal, and in 1947 he received America’s major prize in medicine – the Lasker Award. Avery lived mainly for his work. He never married and had no children. He never lost his fondness for music, and in his vacations he enjoyed spending time sailing. He had been a notable public speaker and debater at college, but in his professional life he was usually reluctant to speak in public. In fact, he was really only at ease in his laboratory, in the company of his researchers. Everyone called him ‘Fess’ – short for Professor. In 1948, age 71, Avery moved to Nashville, Tennessee to enjoy some family life. He rented a large house close to the home of his younger brother Roy, who was teaching bacteriology at Vanderbilt University. Avery spent a lot of time with Roy’s family. His cousin Minnie Wandell became his housekeeper. Oswald Theodore Avery died age 78 on February 20, 1955 in Nashville of liver cancer. He was buried in Nashville’s Mount Olivet Cemetery. "Oswald Avery." Famous Scientists. famousscientists.org. 20 Jul. 2016. Web. Image of DNA in flask in the Berlin Museum of Natural History by LoKiLeCh under the Creative Commons Attribution 3.0 Unported license. Image of Frank Macfarlane Burnet by Denver Faingold under the Creative Commons Attribution 4.0 International license.